1. Is the cable plug pushed all the way into the port? 2. Verify their power at the power pins is correct (eg +9V to +Vs, -9V to -Vs) - test with a multimeter. 3. Electrodes are not reusable. How do you guys get over the whole danger of people thinking this is a medical device? Is the "Note" at the bottom enough? I also noticed there was no "battery-powered only" warnings. the error is this: ArrayIndexOutOfBoundsException:3. P.S. My arduino Uno is COM3. I've tried many ways to solve my problem but I Didn't get it. println(Serial.list()); // Open whatever port is the one you're using. The values which we get from AD8232 are as follows: 483 481 480 485 492 501... What are these values ? Are these voltages or what? Hello everyone. Can this sensor measure also the muscolar contraction? Hi i am trying to send the ECG signal via wireless to the PC to processing(maybe). Is there. i use arduino uno. My all connections are true. I always get square wave. Please help. I cant understand what is reason this? Moreover, the LED which is supposed to indicate heart beat is not blinking and it is always red! The only difference in my setup is that I have connect the board to the A2 analog pin. I have also soldered male pins to the board (LA, RA, LR). Am I doing something wrong? Has anyone faced similar problem with this product? Can it be so, that those soldered extra pins affect on the functioning of AD 8232? have you tried using processing for the output. you may have to use another program called processing that draws out the signal for you. Was trying this with multiple Arduino boards and was happy to know that it works on all! However, the signal I had a problem. The T part of the wave has the same amplitude as the R peak, is there anything I can do to remedy this problem? I tried it with a few of my friends too and the results are all the same. Can I use the monitor with an Arduino Yun? Coz I am working on a wireless ECG monitor and other similar projects. Please reply me the advantages and drawbacks of using this with an yun.. I see no difference between using this with the Yun vs the Leonardo or Uno. The biggest issue will be that this board run at 3.3V and not 5V. Since all the I/O pins on the Arduino seem to be inputs you won't be sending 5V to the board, so just make sure you are powering it correctly and it should work fine. does this heart rate monitor sensor board, leads and the cable follow any industrial standard (e.g., http://www.fda.gov/MedicalDevices/DeviceRegulationandGuidance/GuidanceDocuments/ucm073942.htm#14_3) during the design, manufacture and post manufacture quality test? how safe is it to connect to a human body directly following your hookup guide? is there any known potential risk when applied to human? We followed all precautions outlined in the datasheets. Our internal testing procedures look for circuit faults, manufacturing defects, and general functionality. Following the hookup guide I had one stuck to me for a few hours in various spots (looking for ideal placement of sensor pads). Since this is more of a demonstration board and less of a medical device, we can't offer the same guarantee as a medical device company. As our disclaimer states: This product is NOT a medical device and is not intended to be used as such or as an accessory to such nor diagnose or treat any conditions. Let me know if this answers your question. Could you please tell me the modification i can make in the Arduino codes, to send the ECG wirelessly to the PC or perhaps a way to communicate and ECG using two arduinos and then print it to processing. CaseyTheRobot, thanks for the reply! I read and understand the disclaimer statement of your website. But for a hobbyist or a student that use or plan to use this this heart rate monitor in their biomedical exploration, what is the safety guidance for them if they hook up on their own bodies? I understand the required supply voltage of the sensor is pretty low. but how do you ensure the electrical current flow through the electrodes near the human heart is always low within safety range? For example, can this device be safely used in a university classroom on students for teaching and learning purpose? I just looked over the schematic and the resistors being used are pretty big (between 180k and 10Mohm). These are to help isolate the person from the circuit. However, it is VERY IMPORTANT to use a completely isolated circuit. In short, do not attach this in any way to anything plugged into a wall outlet. This must remain battery operated for safety reasons. If you need to get serial data from the MCU then you are stuck either doing it wireless or through USB/serial on a laptop that IS NOT plugged into a wall or Ethernet cable. Hi! Would you recommend this device for measuring biosignals from plants? Has anyone used this ECG board with two leads/electrodes? The reason I ask is because I see an error in the schematic. R18, which is not installed for 3-lead configuration, should go to RLD and not to SW. Refer to fig 62 on page 24 of the AD8232 datasheets. How difficult would it be to have the rate be displayed on a 16x2 LCD ? Does anyone know if I can use Arduino Uno ? However, I ordered my own PCB that was identical to yours (I copied the eagle brd file) and tried populating it myself and it didn't work.. I've tried both reflow and hand soldering and neither method has produced a working board for me. Do you have documentation on how you populate your boards? Did you run into any similar problems when first working with this IC? The only special consideration we have taken was with the GND pad of the AD8232. We reduced the solder paste size greatly because we found the chip floating and making bad connections. Try reducing or removing the solder from the GND pad. 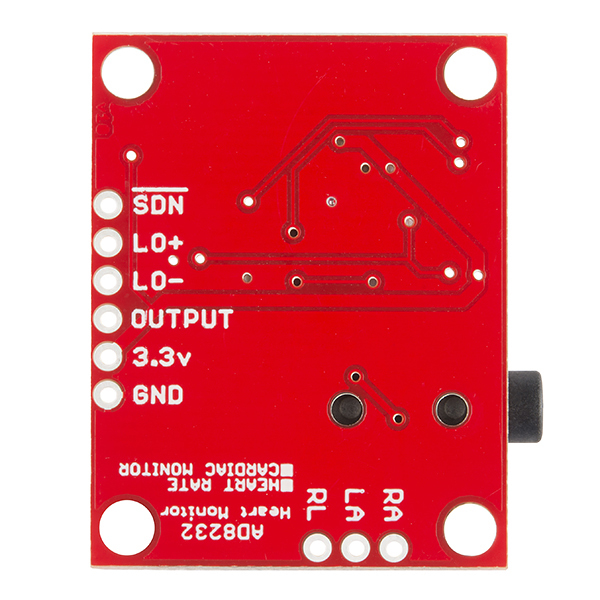 If you are using our breakout, the !SDN is tied to 3.3v by default. The AC/!DC line is tied to ground by default as well. The square wave you are seeing is the "Lead Off" Detection. You may need newer sensor pads if all three are not making good contact with skin. Hello i also get a square wave. My all connections are true. Please help me ? Also, the leads off detection should only display a flat lined output at half or almost the potential, which it does on the good sf board, but I can't get to seem to get an ecg waveform at all from one sf board or mine... And this output is quite intriguing me..... I want to say emi but why on two only and not the other? 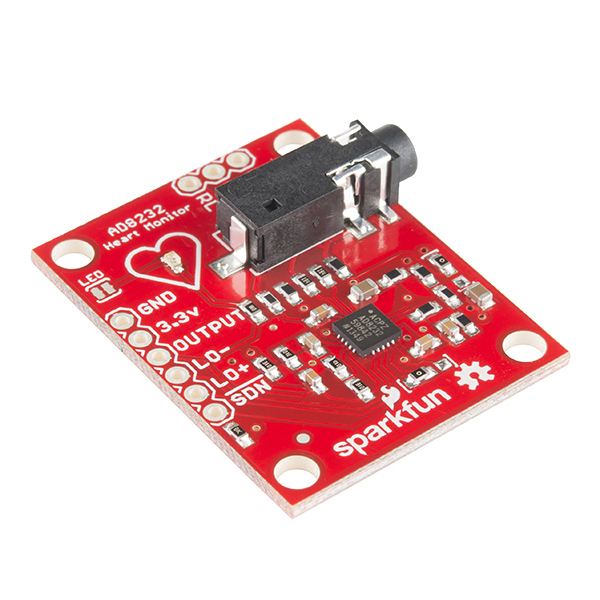 with operating voltage at 3.3V, what is the analog output range of this Single Lead Heart Rate Monitor - AD8232 (0-1.5V)? thanks! after carefully read the AD8232 data sheet. I derived the range similar as your answer. According to the data sheet, the voltage at the analog output terminal (OUT) swings in between 0.1 Volts and Vs â 0.1 Volts, where Vs is the supply voltage. If using 3.3 Volts as Vs, the output range is 0.1 â 3.2V. Have connected this to a Arduino pro mini 328 and that in turn connects to a Raspberry Pi to run the processing. Both the Pro Mini and AD8232 run off of the 3.3v GPIO, whilst I get a good trace I also pick up 50hz (UK) noise and although adding a few caps diminishes it is still quite noticeable. Any thoughts of how to lower the noise? For example would it be good to run the Arduino and AD8232 from their own 3.3v regulators and have these use caps to lower the noise also? Any help would be appreciated as the pro mini 3.3v 328 & Pi make a great combination. I reduced the noise by giving each component a 3.3v through a regulator off of the 5v Pi line and also moving things around so that the 3 sensor leads didn't come near or cross any other signal or power traces. Oversampling also reduced the noise. Are you planning to remove the IC from the board? Try turning down the air flow, sounds like you are blowing the chip off the board. lots of flux and don't add much solder to the ground pad, without a stencil and paste, it can be tricky. you should be able to melt the solder and use surface tension (and a nice toothpick or tweezer end) to poke the chip in place. Good luck! I plan to use this without a micro-controller. Any suggestions on how to power this? What is the voltage range it will actually accept, still function and not burn? Is 3.3V a hard upper limit or will it accept 5V or 9V? What about in the other direction, like 3.0V from a coin battery or 2xAA betteries? In the tutorial, the pin connection table shows LO- is connected to Pin 11 on arduino and LO+ is connected to Pin 10. However, on the connection diagram graph, LO- is not connected to arduino and LO+ is connected to Pin 11 in green wire. ?? can i connect the pads to the wrist? or do the 3 pads have to be connected at the heart area? Is it electrically isolated from the power supply? The leads are not 100% isolated from VCC. There are 180k ohm resistors in series with each lead. This is aimed to prevent any stray high currents. Diodes would block the low voltages produced by muscle contractions. Yes, realized my mistake after..... Diodes voltage suckers..... Ha ha! Sorry brain fart! When I followed the tutorial to try it, the plot is upside down. Any idea? Are you sure you don't have the RA and LA electrodes backwards on your chest? That was pointed out by a med school friend of mine as well. I tried reading into it and didn't get far. I didn't know there was a prefered placement until it was pointed out. hey!.... the last answer is 38 minutes and 20 seconds.... Awsome video! I love you SparkFun. Thank you Robert to be on time every friday. You make me dream, thanks a bunch! The github repo doesn't appear to exist! Try again? I think it got switched to private by accident. The eagle files link takes us to the schematic, and the github link to a 404 website. Just letting you know, in case you can modify this. Primary protection against electric shock is provided by the resistors in series with the arm and leg leads. SF should confirm that those resistors also are rated for >36V insulation resistance and that the clearances of the leads are sufficient for that voltage. Although SF customers are generally savvy, my rule for design of such devices is that they should not conduct even if an idiot user touches 120V and the device is earth-grounded. Did you add the AD8232 and 3.5mm stereo jack to the SF eagle library? You might need to do a fresh "git pull" to update. yes! if it's a board we make, you will find all the parts in the eagle library by the time the product is listed on our site. The device operates stably and efficiently .. The circuit is taken from the example in the manual on used chip. I think that for young researchers is not the best option circuitry - The default is three-electrode circuit. Redid two electrode - Very wide bandwidth filter. A significant level of interference from 50Hz. Need to shift the frequency of low-pass filter to 20Hz. In general, the best of cheap amplifiers cardio." I was experiencing heart palpitations so I thought I would try this product out and do some self diagnosis. I hooked it up to an Arduino nano. Since my symptoms occur mostly at night I hooked myself up when I awoke at midnight in bed and immediately fried the first unit I bought, evidently by ESD from static generated by my bedsheets. You might beware of the potential for ESD and discharge yourself to ground before hooking yourself up with this product. So, after buying a replacement unit I successfully got traces of my heart events. I matched my EKG waveform to traces I found online and guessed that my symptoms were caused by Premature Ventricular Contractions (PVC) which typically has onset in men my age. My self diagnosis was later confirmed by a cardiologist after reading data from a clinic provided 24 hour Holter monitor. Working GREAT with UNO and Windows PC as described in the sample code. This is an amazing device, and it is very complete. It might last like 5 seconds to stabilize, but after that, is really good. The bandwith is too big, I don't like this, because any movement makes noise because of the muscle signal, it goes all the wat to 1k Hz, and a normal ECG doesn't goes more than 250. I tried to get a trigger from my heart rate in order to sincronyze s Scope but didn't receive nothing in the Output, neither couldn't see the red Led beating. Pls. Send to me some advice. THIS IS NOT A COMPLAINT! I was using an Olimex ECG Shield which is a full-size shield for Arduino Uno (or equivalent) and wanted something that took up less room. 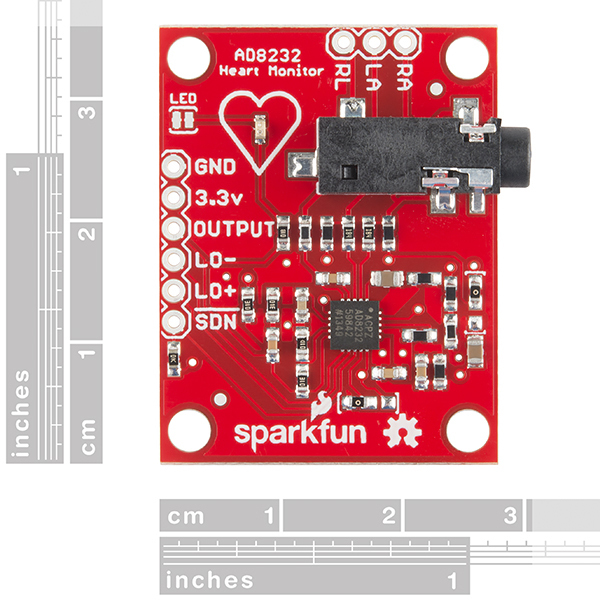 The SparkFun AD8232 is about 1/3 the footprint of the Olimex. The SNR on the Olimex is about 10x better. The AD8232 produces a usable ECG signal only if the subject sits very still, it's powered by a battery, and the LO+ and LO- lines are left disconnected to further reduce noise sources. Not adequate for my purposes. One other thing, you'll need to use Processing 2.0 for the display. The sample sketch does a no-no in that it draws lines to the display from a Serial Event thread and Processing requires drawing operations be done from the Animation thread. Processing 3.0 enforces thread safety. Took a while to setup (not to mention, this is my first time using Processing). Once I figured out how to run everything, it works great! On a side note: use Processing 2.2.1 for the sample code. HR monitor works nice, but SNR was bad. How can I adopt HR monitor to 50 Hz noise? It actually works! for hobby purposes. Hooked it up to an UNO, using 3.3V to power this module of course. Used fresh EEG electrodes - Silver-Silver-Chloride - same as EMG but not EEG - necessary for monitoring around 0.5 to 2HZ. Using Arduino Serial Plotter I get a nice QRS. Unfortunately there is so much noise in the signal, lots of 60HZ mains and lower amplitude just noise, so you'll have to do some notch filtering at least, and FFT or other software signal conditioning to get a clean readout. But this is a lot better than fooling with op amps. I really like the price and functionality of this item, however assumed it would come with header pins (or at least emphasize that it did not/suggest to buy with them). It was a bummer when it came without them. Other than that, highly recommend! 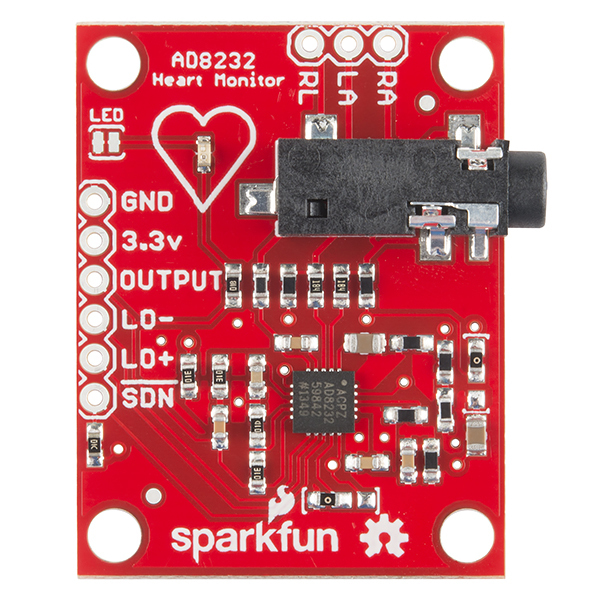 I've looked at DIY heart monitor circuits before but with the microvoltages involved it would have been a major project to prototype my own. This works great - compact with the noise reducing bypass caps all in place. Running it off a 9V battery through a L78L33 regulator and viewing the output on an inexpensive $25 digital oscilloscope kit from eBay for display. It gets boring really quick, but it's a fun science project and would be great for classroom demos. Oh, and you can buy the adhesive sensor pads in bulk really cheap elsewhere. I developed atrial fibrulation last November and have been in a permanent afib state since then. This board and project gave me my first opportunity to work with the Processing application for Windows. Works like a charm, gives a recognizable EKG when wired as directed and clearly indicates my particular condition. Working on controlling or reversing the afib under my cardiologist's care, but it's fun to make and use an actual tool for viewing the data. I used this, and the demo code, to build a wearable EKG display. Because the TFT I used took so many oins, I used an Arduino Mega 2560. Sadly, I ordered what looked to be the same device online but neither unit would work. I will stick to Sparkfun in the future for these.